Another month, another humongous CPU cooler. Gelid's Black Edition is certainly impressive in stature, but thankfully for something this size it's more than matched by the build quality. To give you an idea of how big this tower cooler is, it comes with two 120mm cooling fans and will support another… you know, if for some reason two just aren't adequate. It weighs almost a kilo too, so it needs exceptional build quality and a decent mounting solution. It supports an impressive array of sockets, including Intel LGA2011, 1366, 1156, 1155 and even the ancient 775, as well as AMD's AM2, AM2+, AM3, AM3+, FM1 and FM2. Although it's a biggie, the mounting plates allow the cooler to be mounted in one of four horizontal planes so you can keep it away from any heatsink-heavy RAM. The design of the Black Edition sees the cooling array split into two towers, enabling you to fit a fan between the two fin-stack arrays. This design also has the added benefit of giving the cooler a wider contact footprint. The cooler isn't a direct contact design - that is to say, the heatpipes pass through the contact plate, not underneath it. The contact plate itself is copper-covered and the seven heat pipes (three 8mm and four 6mm) are nickel-plated copper. The way these pipes are arranged is rather unusual. Traditionally, heatpipes are soldered in a row, which is fine when there are five pipes or fewer, but above that number the outer pipes become less efficient at handling heat dispersal than the inner ones. Gelid has got around this by stacking two of the 6mm pipes on the 8mm ones so all seven pipes are working efficiently. 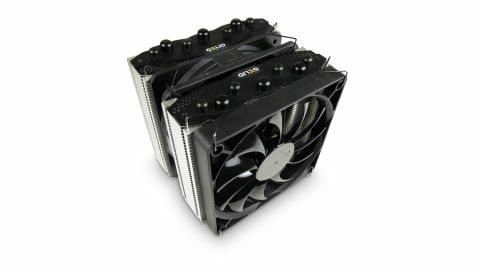 Gelid supplies two of its own 120mm fans with the cooler. Both are PWM designs, but the two are slightly different. The front fan is a Gelid Slim unit that spins between 750 and 1,500rpm (quoted at 25.5dBA), while a silent model sits between the two cooling arrays and spins between 750 and 1,600rpm with a maximum quoted noise level of 25.4dBA. Fitting the Black Edition is relatively straightforward. The backplate is attached to the rear of the motherboard by four screws. These are held in place by tool-free locking standoffs, with the pair of cooler mounts fixed on top. When it comes to fitting the cooler itself to these mounting plates, it becomes a tad fiddly. You'll need fingers like Nosferatu to get to the pair of screws set between the two fin-stacks and connect it to the cooling mounts. The stacked heatpipe design makes for an impressive cooler, and means all seven of the pipes run more efficiently than the traditional heatpipe lineup. Despite the vast size of the cooler, it's this compact heatpipe design that stops it getting prohibitively big. The only real bugbear about the cooler is the fiddly way you have to mount the cooler to the base plate - narrow fingers really do help. A real bonus, however, is Gelid's decision to bundle the excellent GCExtreme thermal compound in the box.